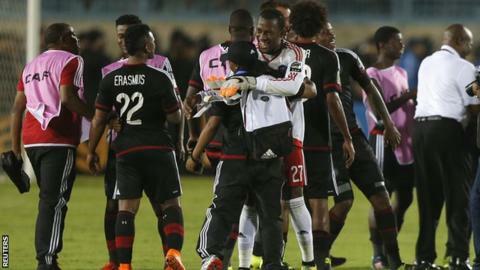 Etoile du Sahel of Tunisia will meet South Africa's Orlando Pirates in the final of the Confederation Cup in November. Pirates recovered from two goals down in Suez to beat Al Ahly of Egypt 4-3 in Sunday's semi-final second leg to win 5-3 on aggregate. Etoile survived a second leg comeback by Zamalek of Egypt on Saturday. Leading 5-1 from the first leg, Etoile lost 3-0 in Cairo to Zamalek but squeezed through 5-4 on aggregate. Zamalek played 85 minutes with 10 men after Ali Gabr to a straight red card, Etoile had Marouene Tej dismissed with quarter of an hour to play after a second bookable offence. Kahraba, whose real name is Mahmoud Abdel Moneim, scored in each half for the White Knights and a Ghazi Abderrazak own-goal midway through the second half triggered a tense climax. Etoile are the third most successful African club after Ahly and Zamalek, and the only one to win all five competitions. Pirates held a slender 1-0 advantage from the first leg but Al Ahly took a 2-0 lead midway through the second half as Gabonese Malick Evouna scored twice. Kermit Erasmus, Thamsanqa Gabuza, Thabo Matlaba then scored to restore the advantage for the South Africans. Amr Gamal pulled another goal back for the eight-time African champions in injury time only for Thabo Rakhale to find the target minutes later to inflict a rare home defeat on Ahly. Both teams were held back at the stadium after the final whistle as the security forces dispersed some angry Ahly fans. The climax of the second-tier African club competition is set for successive weekends between November 20 and 29 with the first game in South Africa.